Lonely for laughter, a carousel animal goes on a courageous journey in Randy Cecil's delightful new picture book. Gator loves everything about being a carousel animal the flashing lights, the calliope music, and most of all, the laughter. But day by day, week by week, fewer and fewer people come to the amusement park, until one day, no one comes at all. 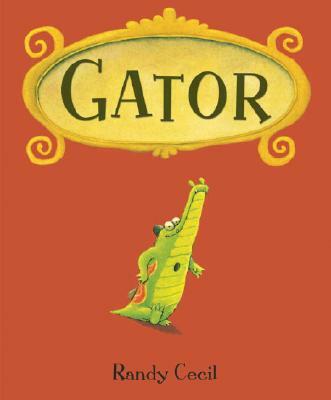 And so begins an extraordinary odyssey, as Gator leaves behind the only life he's ever known and sets off through some deep, dark woods to a place with REAL alligators and a wonderful, familiar sound. Illustrator Randy Cecil puts on his author's hat for this moving story of a modest carousel alligator who finds what he's looking for and becomes a hero along the way. Randy Cecil has illustrated more than half a dozen books for children, including AND HERE'S TO YOU!, MY FATHER THE DOG, and WE'VE ALL GOT BELLYBUTTONS! He lives in Houston, Texas, where he also grew up.